Lavender is widely known as a natural stress reliever as any aromatherapist would tell you. Recently though a Lavender oil capsule containing the medicine known as Silexan has been approved in Germany for the treatment of anxiety and marketed as Lasea. Lasea is a natural herbal treatment for anxiety, unrest and insomnia in adults. The Lasea capsules contain oil from the narrow leafed English Lavender(Lavandula angustifolias) grown in Provence and steam distilled immediately after harvesting. The Lasea capsules contain 80mg with higher levels of two key natural ingredients, linalool and linalyl acetate, in Lavender oil and are sold as an anxiolytic (anti-anxiety) medication over the counter in Germany pharmacies. The recommended dosage is to take one Lasea pill daily. Silexans positive effects have been approved and acknowledged by the German FDA. There are reports from Lasea users that they are finding much needed relief for depression, sleep, and panic disorders. Lasea is not a tranquilizer but works to get the nervous system back in balance. The Lasea accompanying information states that there is no risk of addiction or lingering tiredness. Reported side effects are rare and mild such as the "perception of a Lavender scent" and "mild stomach discomfort" that soon dissipates. 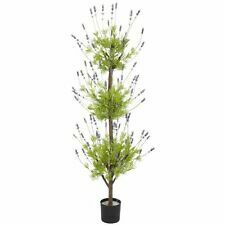 Looking for Lavender Plants? Find a wide selection of plants for your garden here in our Plants Store. Find a wide selection of products containing pure essential oils from Lavender flowers in our Essential Oil Shoppe.